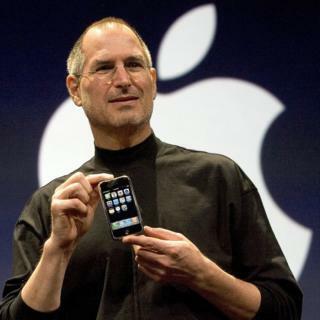 On 9 January 2007, one of the most influential entrepreneurs on the planet announced something new - a product that was to become the most profitable in history. There is the fact that it created a new product category: the smartphone. The iPhone and its imitators represent a product that did not exist 10 years ago but now is an object of desire for most of humanity. There's the way the iPhone transformed other markets - software, music, and advertising. But those are just the obvious facts about the iPhone. And when you delve more deeply, the tale is a surprising one. We give credit to Steve Jobs and other leading figures in Apple - his early partner Steve Wozniak, his successor Tim Cook, his visionary designer Sir Jony Ive - but some of the most important actors in this story have been forgotten. Ask yourself: what actually makes an iPhone an iPhone? It's partly the cool design, the user interface, the attention to detail in the way the software works and the hardware feels. But underneath the charming surface of the iPhone are some critical elements that made it, and all the other smartphones, possible. The economist Mariana Mazzucato has made a list of 12 key technologies that make smartphones work: 1) tiny microprocessors, 2) memory chips, 3) solid state hard drives, 4) liquid crystal displays and 5) lithium-based batteries. That's the hardware. Then there are the networks and the software. So 6) Fast-Fourier-Transform algorithms - clever bits of maths that make it possible to swiftly turn analogue signals such as sound, visible light and radio waves into digital signals that a computer can handle. At 7) - and you might have heard of this one - the internet. A smartphone isn't a smartphone without the internet. At 8) HTTP and HTML, the languages and protocols that turned the hard-to-use internet into the easy-to-access World Wide Web. 9) Cellular networks. Otherwise your smartphone not only isn't smart, it's not even a phone. 10) Global Positioning Systems or GPS. 11) The touchscreen. 12) Siri, the voice-activated artificial intelligence agent. The foundational figure in the development of the iPhone wasn't Steve Jobs. It was Uncle Sam. Every single one of these 12 key technologies was supported in significant ways by governments - often the American government. And the internet itself started as Arpanet - an unprecedented network of computers funded by the US Department of Defense in the early 1960s. GPS, of course, was a pure military technology, developed during the Cold War and opened up to civilian use only in the 1980s. The most common such algorithm was developed from a flash of insight from the great American mathematician John Tukey. What was Tukey working on at the time? You've guessed it: a military application. Specifically, he was on President Kennedy's Scientific Advisory committee in 1963, trying to figure out how to detect when the Soviet Union was testing nuclear weapons. Smartphones wouldn't be smartphones without their touchscreens - but the inventor of the touchscreen was an engineer named EA Johnson, whose initial research was carried out while Johnson was employed by the Royal Signals and Radar Establishment, a stuffily-named agency of the British government. The work was further developed at Cern - those guys again. Eventually multi-touch technology was commercialised by researchers at the University of Delaware in the United States - Wayne Westerman and John Elias, who sold their company to Apple itself. Yet even at that late stage in the game, governments played their part: Wayne Westerman's research fellowship was funded by the US National Science Foundation and the CIA. Then there's the girl with the silicon voice, Siri. As for hard drives, lithium-ion batteries, liquid crystal displays and semiconductors themselves - there are similar stories to be told. In each case, there was scientific brilliance and plenty of private sector entrepreneurship. But there were also wads of cash thrown at the problem by government agencies - usually US government agencies, and for that matter, usually some arm of the US military. Silicon Valley itself owes a great debt to Fairchild Semiconductor - the company that developed the first commercially practical integrated circuits. And Fairchild Semiconductor, in its early days, depended on military procurement. Of course, the US military didn't make the iPhone. Cern did not create Facebook or Google. These technologies, that so many people rely on today, were honed and commercialised by the private sector. But it was government funding and government risk-taking that made all these things possible. That's a thought to hold on to as we ponder the technological challenges ahead in fields such energy and biotechnology. Steve Jobs was a genius, there's no denying that. One of his remarkable side projects was the animation studio Pixar - which changed the world of film when it released the digitally animated film, Toy Story. Tim Harford is the FT's Undercover Economist. 50 Things That Made the Modern Economy was broadcast on the BBC World Service. You can find more information about the programme's sources and listen online or subscribe to the programme podcast.